Our Instructors are not only highly educated and certified, we also care deeply about your health and wellbeing. Tracy is a Certified Personal Trainer, USA Cycling Coach, Spin Instructor, Sports and Exercise Nutrition Coach (Pn L1), and Integrative Nutrition Health Coach with a diverse athletic background in mountain biking, road cycling, surfing, skiing, hiking, climbing, CrossFit and many other sports. 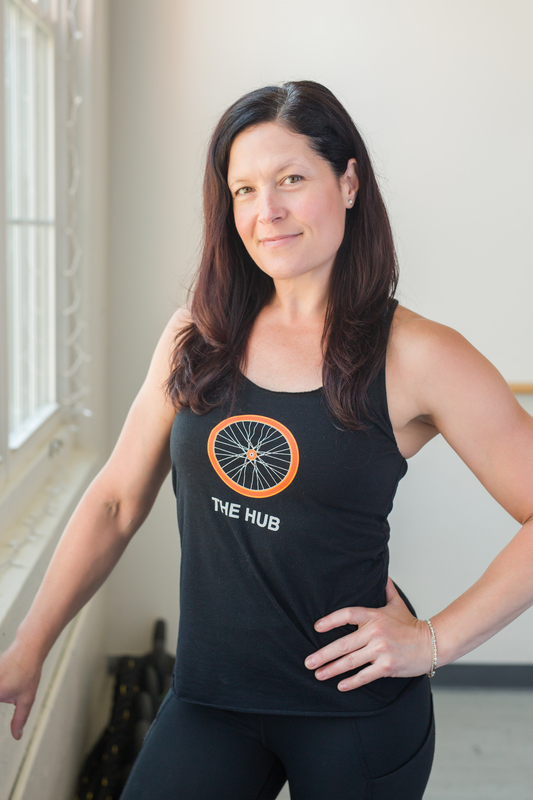 Her true passion lies in all things cycling and related, and intends to provide a fun and supportive environment for you to continue to evolve in your health and fitness. Her approach to indoor cycling models and mimics what you would experience in the outdoors, pushing you to your limits and motivating you to bring all you’ve got to the moment. This high intensity strength and power training is balanced with intentional awareness of the breath and the mind, merging functional movement skill building with a focus on the mind-body connection. Tracy has experienced serious physical injuries and has gone through months where simple movements were painful. Using a combination of physical therapy, yoga, TRX, positive psychology, and stationary cycling, she was able to rebuild and regenerate all the neuromuscular pathways necessary for proper movement and function. These efforts got her back and better than ever on her road bike, mountain bike, and skis. These hardships taught Tracy that we can get through anything by facing it with a positive attitude and doing one simple thing at a time to get better. 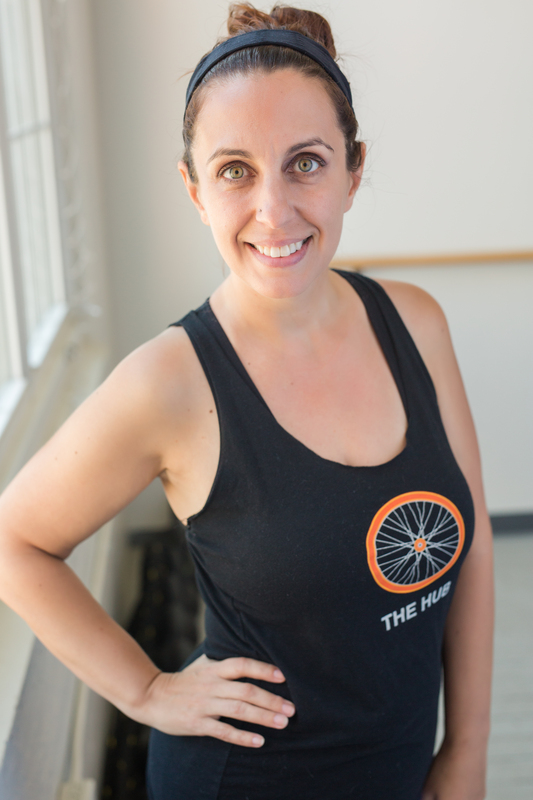 We all have the ability to strengthen and heal ourselves and Tracy wants to help others achieve optimal health by bringing high energy focus, mind-body awareness, and specific intention to have fun and get the most out of your time on the bike and in the gym. Allie is an avid horseback rider and was always active through high school. A knee injury in her late teens prevented her from doing many of the things she loved. Fast forward to 2015, Allie had enough of the excuses! It was time to be healthy, confident and strong. Coming off of an injury can be devastating, which is why Allie was inspired to become involved in the fitness profession herself. Through education and hands on experience, Allie has discovered that fitness can be functional and fun. Allie has worked with individual clients and in group fitness settings. She prides herself on making exercise fun and accessible for all. When the Hub opened in 2017, Allie was thrilled to find something to meet new people and differentiate her fitness routine. This is where Allie fell in love with Spinning! Allie is a social studies teacher and her philosophy is the same at school as at the fitness studio. Allie's goal for each class is to empower individuals to be their best selves by teaching them the tools for success, physically and mentally, to achieve their goals. 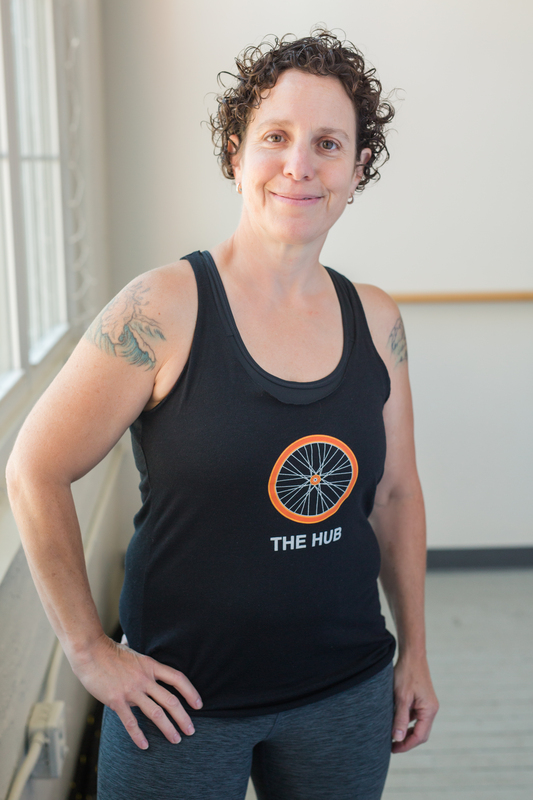 She looks forward to seeing you at one of her classes or at any event at the Hub studio! I am a seasoned athlete who is passionate about hard work, persistence, dedication, and teamwork. After a hamstring injury sidelined me from the 400m race in Track, I refused to give up or give in, and I redirected my focus. I began throwing the javelin, and I broke a 30-year-old school record, which I still hold today. I was named All-Western Mass in both Soccer and Track and Field. I was selected All-American in Soccer during my time in Junior College, and I went on to compete in Division Two Soccer at the college level. In more recent years, I have dived into running. I love running for its simplicity; just throw on your sneakers, hit the pavement, put on some good music, and let go. I have participated in a number of local 5Ks and 10Ks. I enjoy using each race as a benchmark to gage my fitness, and with each race I strive to train harder, recover conscientiously, and seek improvement. Apart from running, I enjoy being outdoors; swimming, hiking, biking, volleyball, kickball, you name it. By day, I am a hairstylist, and I feel privileged to be apart of a profession whose objective is to make people feel beautiful. I truly love TRX because it is a personalized workout that you can never outwork or outgrow. There is always room for progression and pushing through your perceived limits. My classes are built on a foundation of seven different movements that our bodies are naturally designed to do. We will work diligently to become better in those areas while building strength, building confidence, and improving our overall health. I am so fortunate to be apart of such a wonderful community. I hope to inspire people, have fun, and help you find your inner strength and confidence, regardless of where you are in your fitness journey. I have always considered myself an athlete, one who loves movement of all kinds. I have played and coached soccer, studied and taught martial arts, and enjoy cycling, hiking, paddling, and anything that gets me moving indoors, outdoors, alone or with others. I fell in love with cycling when I got my first real bike at age 10, and have enjoyed the freedom and intensity of the motion ever since. When I discovered spinning 8 years ago, which combined cycling, music and a sense of community, I was instantly hooked. And when I started spinning at the Hub last year, I immediately knew it was a place where I wanted to teach what I love. For me, a well-designed spin class creates similar challenges to what you would experience outdoors, that allows one to push the body, exercise the breath, and maintain the positivity needed to keep moving forward. 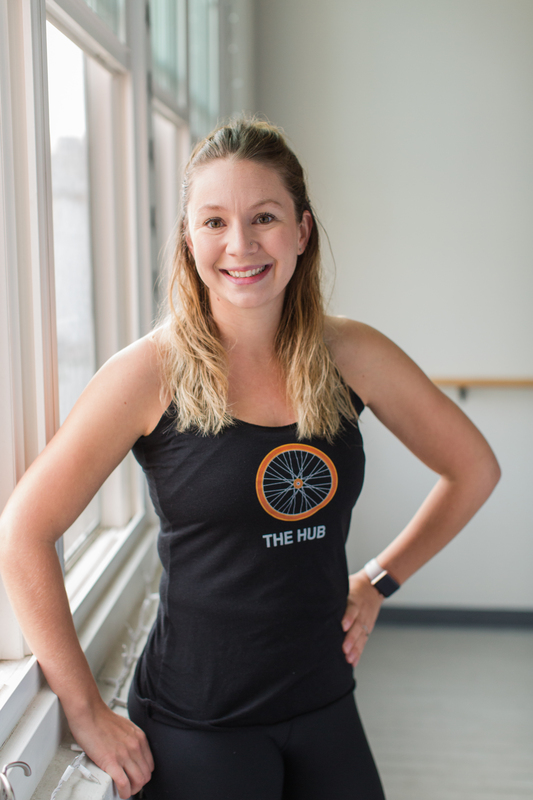 I am honored to have the opportunity to teach spinning at The Hub, and am committed to designing classes that will push people to reach their fitness goals and have fun. After suffering a difficult personal loss in the fall of 2016, I knew that the only thing that would get me through in a healthy way was a full and unwavering commitment to my body, mind and spirit, yet I could not find a space to train that felt like a natural fit. When I arrived at The Hub the first week it opened, I knew I had found my place. I was immediately drawn to the natural light, the bikes, and the positivity of the people. From day one I knew it was a space that could foster my physical, mental and spiritual growth. With eleven years invested in the martial arts, my fitness goals are about maintaining the balance between my mind, body and spirit, and finding my personal strength in the alignment of this triad. I have been a teacher in a middle school Social Studies classroom for 18 years, where I am a strong advocate for developing and maintaining a ‘growth mindset’ approach to all challenges. I approach physical challenges with an open heart and a positive intention, and look forward to helping you do the same. Jesse is an AFAA Certified Group Exercise Instructor and an American Barre Technique Certified Barre Instructor. Throughout her twenties, Jesse was a runner, dancer and exercise class junkie. She considered herself healthy and active. But after having her first child, she began to struggle with exercise consistency and healthy eating habits, and made excuses for her sedentary lifestyle. Once her two children began getting older, Jesse realized she wanted to be active with her children, and be able to bike ride, hike and participate in 5Ks with them. Jesse joined The Hub last year and was instantly inspired to challenge her body in new ways, ways in which she hadn't experienced in fitness classes before. She was no longer saying "I can't do that," and a life-long dream of being a fitness instructor began to finally take form. Coupled with her 15 years experience as an elementary educator, Jesse's fitness philosophy is inspiring others to reach their own personal goals, creating a strong sense of self and an intense mind-body connection. We believe a collaborative, goal-oriented environment supports one’s own commitment to having a strong, healthy body. We know that with an encouraging team of Coaches and like-minded community, a person can impress themselves with just how much they can physically and mentally achieve. We know the body goes where the mind tells it - so we provide an inspiring and authentic coaching environment that fosters deep connection to what motivates you, allowing you to work harder than you ever thought you could to become fitter, stronger, and happier. The Hub values and appreciates bio-individuality and we understand that what works for one person may not work for another. We know everyone is at a different place in their lives, with different goals and objectives that continuously change. As such, we develop fitness and nutrition plans specifically designed for each individual.